Are you a fan of camellias? Discover the Network Gardens where you can admire them! Today, beautiful specimens of Camellias can be admired in the gardens of the Network. Between Italy and the Canton of Ticino, from the first weeks of March and throughout April, it is possible to get lost among the colors and the scents of the Camellias in bloom. In Switzerland, in Locarno, a few miles from Lugano, is the Parco delle Camelie, inaugurated in 2005, to fascinate you with its 850 varieties of camellias cataloged, to which are added 70 still unidentified camellias , planted at the southern end of public paths, and 130 double camellias, which form a dividing hedge and are used primarily to provide cut flowers for the annual show held in spring. In Piedmont, the Mostra della Camelia of the Giardini Botanici di Villa Taranto is the event with which the new season usually begins. 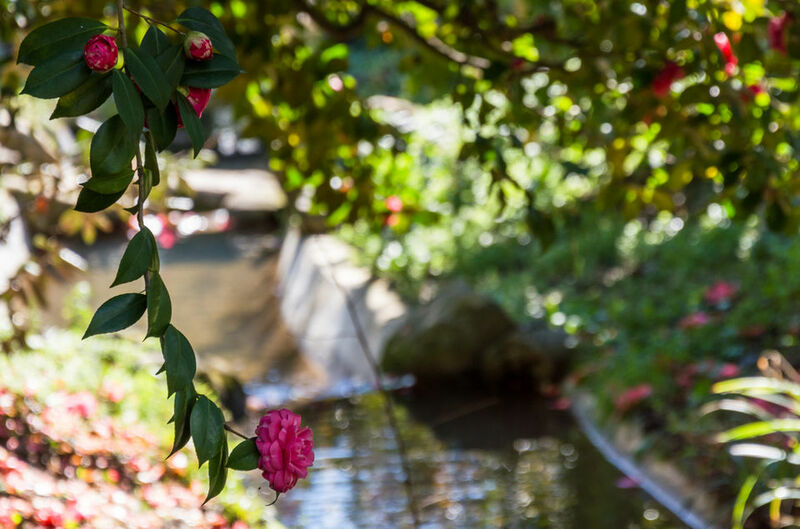 Camellias also adorn the historic garden of the Castello di Miradolo and the Parco del Palazzo Malingri di Bagnolo, where in the last thirty years the employers have planted Japanese and Sasanqua camellias. In Liguria do not miss the collection of ancient camellias of Villa Durazzo (Santa Margherita Ligure, GE), including the famous Lavinia Maggi and Albino Botti. In Lombardy, the gardens overlooking the sweet shores of Lake Como, in spring, celebrate the beauty of this flower with the initiative Camelie sul Lario. A Villa Carlotta (Tremezzina, CO) can be admired by variety and rarity such as the Princess Clotilde, a nineteenth-century variety created by Casoretti, the Japanese Taiyò-Nishiki, the Oscar Borrini, and the Countess Tozzoni. At Villa Melzi (Bellagio, CO), on the other hand, spring is the ideal time to observe the blooming of the historic camellias of the garden and those of the new collection - about 30 young specimens planted in 2014 - from the mother plants that belonged in the nursery of the Rovelli brothers of Pallanza, which embellish the vast and rich gardens. In Tuscany the wonderful Viale delle Camelie of the Giardino della Villa Reale di Malia (Capannori, LU) is waiting to give you an unforgettable walk, while in Florence in spring the flowering of the camellia grove of the Giardino Bardini , placed behind the wonderful belvedere on the city. Further south the colors of the camellias of the Castelluccia of the Reggia di Caserta will not fail to excite you. On the Island of Ischia, then, the Giardini La Mortella is an Eden that never goes into stasis. If in spring the camellias in bloom together with the oriental magnolias and the wisteria, give the garden in Valle an enchanted atmosphere; in autumn and winter the gardens are a riot of color thanks to the sumptuous flowering of the camellias, starting from the elegant Camellia sasanqua, followed by the williamsi, the japonica, the reticulata.